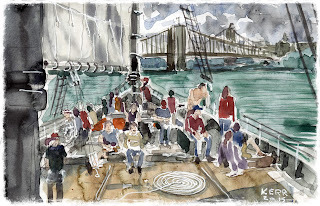 Thanks to all at the urban sketchers boating event. My wife--Val--and I enjoyed it thoroughly. While it was fun to sketch with like minded artists, it was especially nice to see all the approaches to handling the subjects being tackled. I've posted these sketches to FB. but thought, on this page I'd try to conjure up a thought or two about them if only to highlight my favorite bits. Showed this one as a pencil sketch afterward at the Highwater bar and mentioned that I intended to put some color on it. The figures were indicated in the simplest of terms, so when adding color, I stuck to that gestural standard. I used a signo white gel pen for some of the rope. The coil specifically. For that I just laid down a darker value and spiraled out with the pen. I'm particularly pleased with the sail and whatever those little rope things dangling down from it are called. A confabulation amongst sketchers. Drawn from the shadow side of the Kiosk in the middle of the pier. 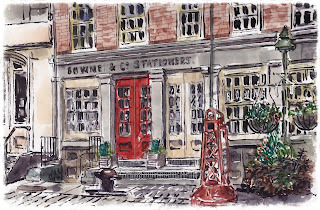 Bowne & Co. Stationers A challenging subject to get right and I'm not quite sure I did it right, but got some good stuff down. 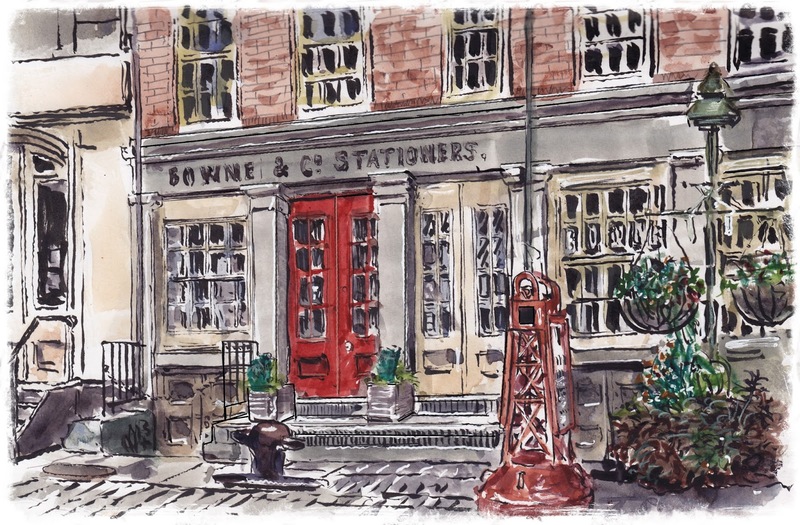 I worked directly with pen in this and established proportions based on the central pillar by the red door. A nice subject to go after. Erika, the young lady modeling on the boat. I draw the figure in a studio setting at least once a week, and found the modeling here to be a bit artificial. Seems for a vintage ship, a vintage costume would best suit it. 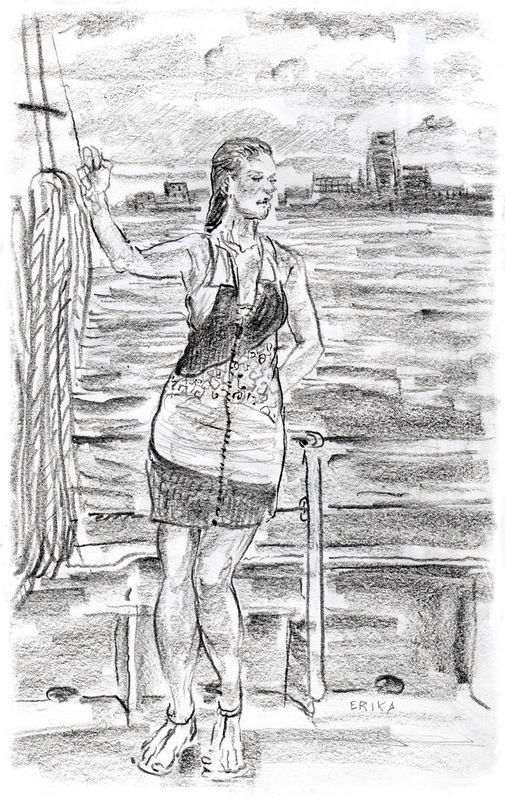 Drew this one with a Derwent Drawing pencil, which lays down a good black, not unlike charcoal, but does not easily smear due to the makeup of the lead. There is a superior version of it I use in the studio with a 5mm chuck holder by Cretacolor. May bring that along at some point in the future. Thanks for showing your work and having us along. Tom, you did a great job on your sketches!!! 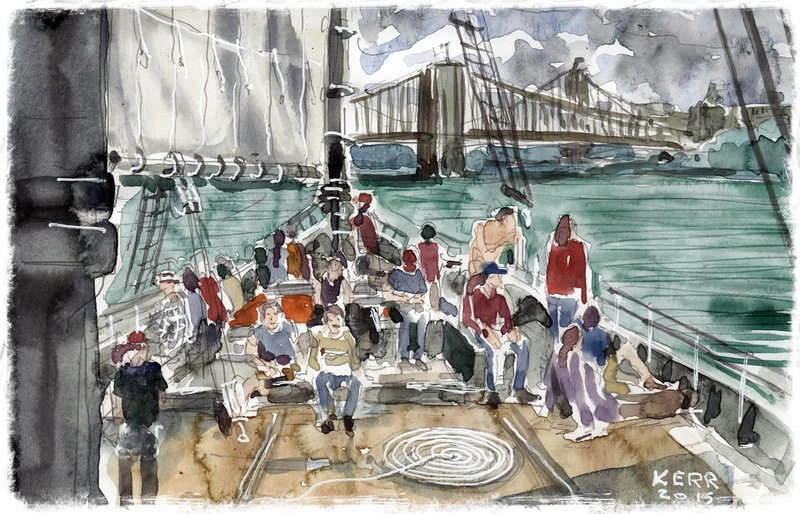 I especially like how you handled the crowd on the boat. 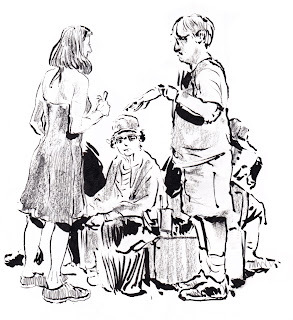 Due to other commitments I wasn't able to join in this past weekend, but I hope to meet you in person at another urban sketching location in the future. Thanks Joan! I'm sure we'll get a chance to chat at some future sketch event.